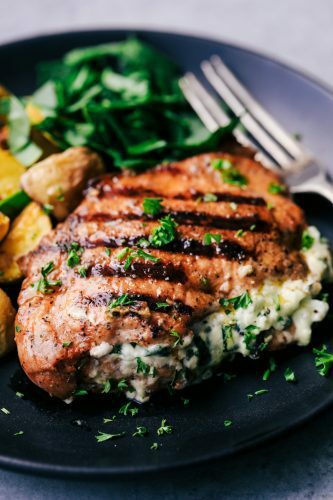 Grilled Spinach and Herb Stuffed Pork Chops are so easy to make and stuffed with a creamy parmesan spinach and herb mixture that takes these delicious and full of flavor pork chops to the next level! Grilling season is in full force at our house! We absolutely love summer and backyard barbeques. 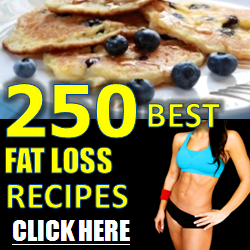 I am always looking for new ideas to grill and delicious new recipes to make for my family. I am partnering with Smithfield to bring you this new and amazing recipe today. 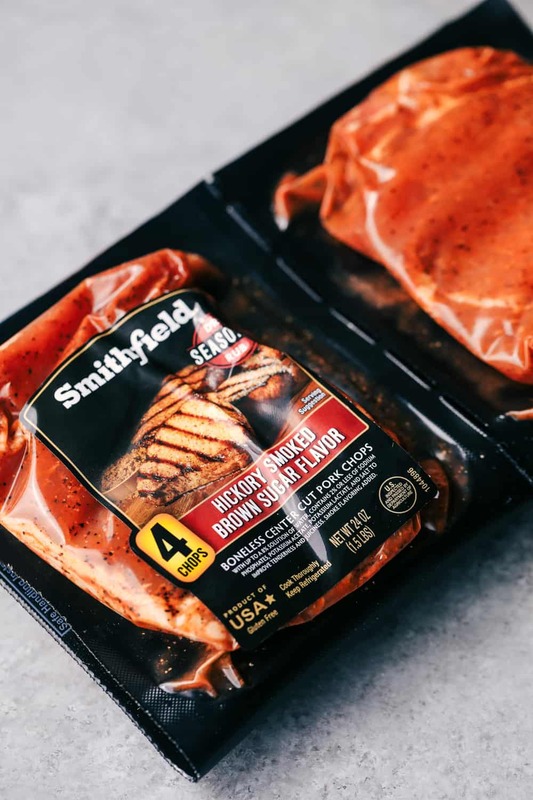 Smithfield Marinated Fresh Pork is my go-to for a delicious, hassle-free dinner that is ready in just 30 minutes or less. As a busy mom of four, I am all for an easy meal that they are going to love. 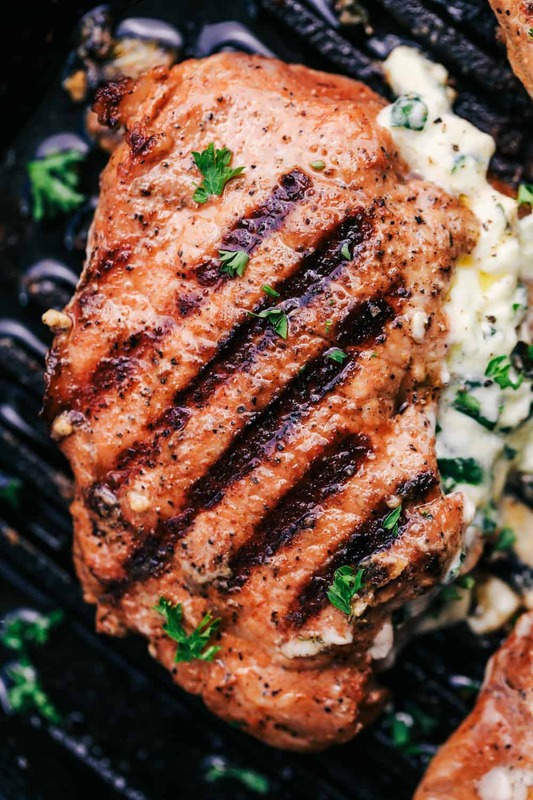 All of the prep work is done for you, so you simply grill, roast, or saute for a meal that is perfect for any night of the week! You will not believe the flavor of this pork! It is slow marinated and perfectly seasoned. 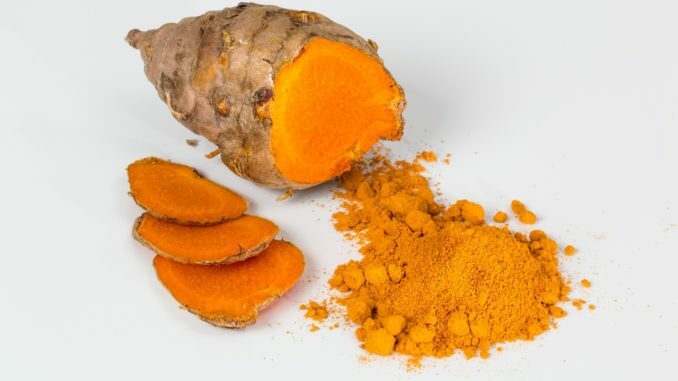 It is available in an assortment of mouthwatering flavors, such as Roasted Garlic and Herb, Applewood Smoked Bacon, Slow Smoked Mesquite, and Slow Roasted Golden Rotisserie. The great thing is, it is made from 100% fresh pork with no artificial ingredients and packed with protein! For this recipe, I used Hickory Smoked Brown Sugar Pork Chops. We loved the sweet and smoky flavor of these pork chops. 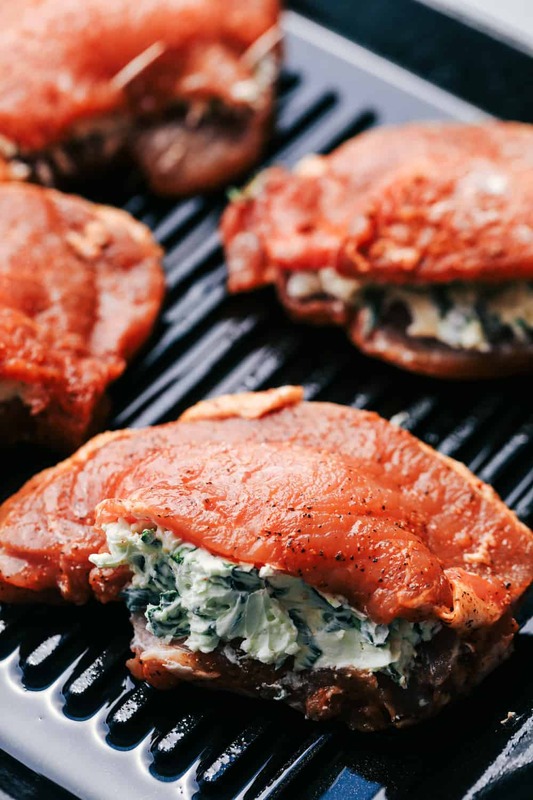 These pork chops were taken to the next level of amazing by being stuffed with creamy parmesan spinach and herb. 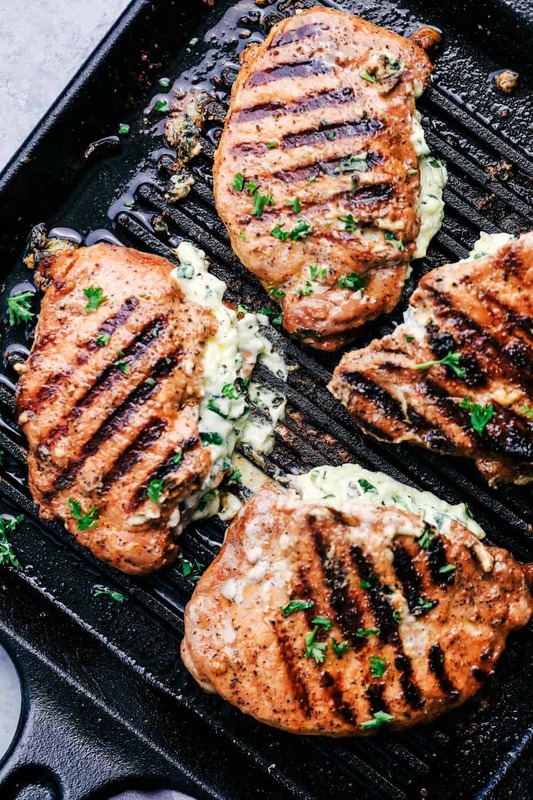 It added a delicious element to these perfectly grilled and tender pork chops and added such great flavor. These were the talk of the dinner table with our family. I know that this recipe will be used again and again at our house and it really is a great addition to your next backyard BBQ! How do I make Stuffed Pork Chops? To start, you simply take the marinated pork chops out of the package. You cut a 3 inch slit with a knife and make a pocket for the creamy parmesan spinach and herb stuffing. Stuff the pork chops with the mixture and fasten sides with a toothpick if desired. How long do you grill pork chops? Place the pork chops on the grill over the direct heat area and sear, turning once, until it gives nicely grilled marks, 2 to 3 minutes per side. Move the chops to indirect heat and cover the grill and cook until no longer pink. The internal temperature should reach 145 degrees before you remove it from the grill. What can I serve as a side to grilled pork chops? Smithfield wants to celebrate grilling heroes and inspire everyone to get grilling all summer long with their “Hero of the Grill” contest. Submit your nominee and give your grilling hero a chance to win $5,000. Plus the first 10,000 nominees with have the chance to have their name featured on Aric Almirola’s #10 Ford at the Richmond race this Septemeber. For more information and contest details, be sure to visit www.SmithfieldGetGrilling.com. Smithfield Marinated Fresh Pork is available at Walmart and select grocery stores nationwide. Preheat your gas grill to medium-high heat and spray with cooking spray. Using Smithfield Pork Chops, slice a 3-inch pocket into each of the pork chops. In a small bowl, mix the cream cheese, parmesan cheese, spinach, garlic, thyme, and oregano. Stuff each of the pork chops evenly with the stuffing and seal the edges with a toothpick. Grill the pork chops in direct heat for 2-3 minutes until each side gets grill marks. Then remove the chops to indirect heat and close the grill. Grill until they get an internal temp of 145 degrees and are no longer pink. Garnish with freshly chopped parsley if desired. This post has been sponsored by Smithfield. I love working with brands that I use for myself. All opinions expressed are 100% my own.